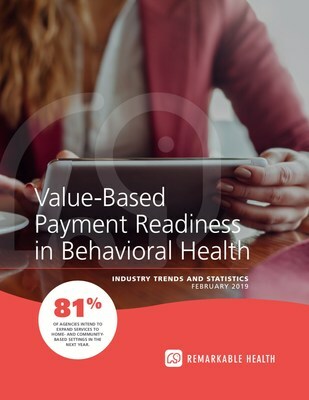 SCOTTSDALE, Ariz., March 20, 2019 /PRNewswire/ -- Remarkable Health, an innovative technology partner for behavioral health and DD providers, announced today new survey data on the IT readiness of behavioral health providers for value-based reimbursement models. The survey results reveal some red flags in preparedness, including a disconnect between the confidence in readiness and the actual IT progress toward readiness. Agencies still using traditional electronic health record technology are seeing the need to upgrade to capabilities that embrace the evolution of how clinicians work with clients and the way behavioral health services are documented and billed. Since many responding agencies also report the intention to expand their services in community- and home-based settings, readiness will increasingly involve the ability to capture clinical documentation in a mobile setting and to capture billing-ready service data from the field to improve client outcomes and lower care costs. Another significant trend from the research is the change in how agencies document and track client engagement and client interaction in their treatment plans—and how well the agency's technology is geared to embrace those shifts, whether thedata is gathered in the field or on a client portal. However, among the issues involved in moving toward successful value-based reimbursement processes, survey respondents identify serious gaps in IT capabilities and staff data capture capabilities, as well as disconnects in documentation workflow and time-to-bill conversions. Remarkable.me: Currently in early development, this client-facing mobile app will reduce dropout and no-show rates by improving the provider-client relationship with real-time engagement capabilities. Powered by Bells, an intelligent care assistant, machine learning will leverage the many data points captured by a provider's EHR platform to increase engagement, enrich the care experience and keep staff informed of clients' progress in between sessions. "The mission at Remarkable Health is to help providers remove the obstacles to quality care and outcomes through technology," says Peter Flick, CEO. "We want to partner with providers to collaborate and identify opportunities to shape technology for the shifts ahead through innovation and thoughtful development." Over the past year, Remarkable Health has worked closely with several providers to develop its offline mobile app for client information, case management documentation and scheduling. "I think the efficiency is probably the biggest advantage," said Shelli Schottler, LMSW, Community Services Director at Pawnee Mental Health Services, Manhattan, Kansas, whose clinicians are using Remarkable Health's CT|One Mobile EHR. "The mobile app helps our staff stay more informed and know what is happening with the client before arriving for a visit. Based on the staff member's role, the app enables clinicians to pull up notes from other providers quickly, which is helpful when our staff members are meeting with other agencies or individuals. That helps us work efficiently and be professional to others."